What if your customers were both individuals and companies? What if your service was something not a lot of people understood, let alone realized they needed? What if you were one of seven people in your whole state who did what you did-so basically any and all local awareness about your profession was up to you? We talked to Carla Tanguay of Modulations Therapies, a music therapist who makes her home in Bar Harbor, about her industry, how she established credibility, and why, despite the fact she’s been only doing this for a couple years on her own, Nicole kept hearing her name everywhere. Most people hesitate to do video because they are worried about having to create 1) long narratives with 2) high production value. That said, we’ve noticed a cool phenomoenon: very short videos in places you aren’t expecting them. Product Video Example From Online Store from Nicole Ouellette on Vimeo. Really though, it’s daters answering questions, which can honestly give you a lot better idea of what they will be like in real life than tons of verbage in a profile can. Vine (8 second videos) have gone away and with Instagram allowing 60 second (or less) videos, it might just be that the internet is a big experiment in the ideal length of short videos and what they can accomplish in that time. How short is too short? What kinds of information can be shown that would be difficult to show in another medium? I personally think we are just getting started. Nonprofits can also benefit from using short videos. This example is from Friends of Acadia sharing the conditions of the trail at the Jesup Path. If you check out their video archive, you’ll find their weather related updates about trails and conditions are fairly short (less than a minute in length). Maine Coast Heritage Trust uses short videos in a similar way. (These videos all use raw footage- no editing, and no one having to worry about talking for the camera). Wyman’s of Maine (the blueberry factory where Kassie worked in high school) shares a lot of short videos like these, sharing how to make smoothies and other treats using their products. Yes, there is a bit of production with this video, but you’ll notice there’s no one talking in front of a camera, and the editing can probably be done using a relatively inexpensive service. The Museum of Modern Art (MoMA) in NYC uses short video clips to offer glimpses of the space, discussions with authors, and closer looks at exhibits. Their video archives have a mix of short videos and longer form (up to 10 minutes). If you have a cool product, a cool location, or a mission that supports cool activities, short videos are a marketing tool that you can definitely use. Short and sweet applies to online video, and your projects too. Where else have you seen short form videos? Are you planning on using these in your marketing? Here’s something I’ve noticed in my tenish years doing this work. Most people HATE to go on video, mainly because you have to worry about how you sound AND how you look at the same time. For example, I video recorded my pastor’s sermons for a few weeks. I noticed everyone was distracted by the tripod and the visible presence of my phone (which was the recording device). So I tried an experiment and this week: I just recorded the audio of the sermon. Now you may ask yourself, “What I can do with an audio recording?” Honestly, plenty. Put a still image with your audio and upload it to Youtube (or Facebook). Use Libsyn or Soundcloud or similar service to host your audio files. Unlike video, audio-only doesn’t have free hosting options, which means you have to figure out where these files are going to live. If you want them off of your website, there are several audio services that allow you to do this. Soundcloud allows 180 minutes free and Libsyn starts at $5/month. Once you upload them to these services, you can embed them or link them other places. (Kind of like how you can’t share a video unless you put it somewhere and then link it – typically these files are too big/annoying to email). Use Media manager or Blubrry in Wordpress (if you have a self hosted Wordpress website). If your site runs Wordpress, you can upload an MP3 (sound file) to your media folder or use the Blubrry podcasting app, which is not only very powerful but also free. Transcribe your recording as a text post. Whether you want to do this yourself or pay someone to do it, having the transcription of an audio can allow you to have/share detailed notes or simply make the content accessible in written form too. Besides these advantages, I don’t have to worry about taking notes and can be fully present. Also, audio recordings take WAY less space than video. So if I think I want video but it doesn’t make sense to have video, audio is the next best thing. 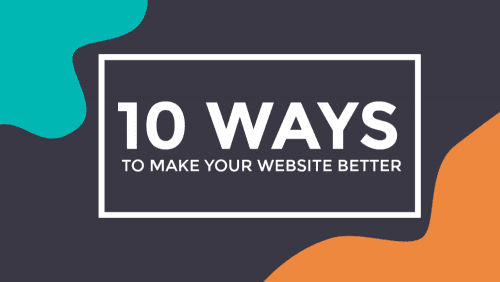 If you have a website, chances are you are continuously thinking about making it better. Here are a few things you may or may not have thought of that you can use on your website. With the invention of touchable screens and cell phones, if you publish a phone number on your website (especially if it’s in an image or a button), why not make it so when people click it, it works? Here’s how to add the code. Save your customers the copy/paste, or worse, trying to repeat the number aloud so they remember it as they dial! Add conditional fields to your forms. Is this item a gift? If the person says yes *then* bring up the gift recipient name, address, and message form fields. Conditional fields in forms show up, as you’d expect, conditionally. They not only allow your form to be shorter and sweeter but allow whatever transaction you are facilitating to be more seamless. People want to stay in touch when you do things like write a new blog post or launch a new product. Give them a way to get a notification when something happens on your site, ideally via email, so they don’t have to miss anything or follow up with you. I use Mailchimp RSS campaigns to do this with new blog posts (plus you can set them to autopost to Facebook and Twitter when they go out) but there is more than one way to set something up. Bonus points integrating signup into existing forms, like your contact form. If you are a non-profit offering a banner ad on your website to those giving you money for X fundraiser, why not add tracking to it? Then when it comes time next year for your contact to ask their boss again for money, they can show them the return on investment. They are not going to ask you to do this but when you do, you will be much more likely to get sponsored again if they can understand their return on investment. Add closed captioning to your videos. Youtube and Facebook both autogenerate them (and you can spend a few minutes correcting them) or you can use Rev.com and get them done for $1/minute. Makes your video more accessible, which is great for people AND search engines. Make PDFs part of your site search. If your website isn’t indexing PDFs as part of the search feature of your website, and you use PDFs with any regularity, consider adding something (a plugin, for instance) so they come up when someone searches for content within them (note: the PDFs have to be readable). Accept credit cards (not just Paypal). This is obnoxious and means people can’t sneak looking at your website at work. Just don’t. Think about your website’s mobile experience. Over half of your website visitors are likely visiting your website from a mobile device. Check how your website looks/works on a mobile device so you can fix issues and make improvements. If you act on any of these suggestions, please comment below (or message us and let us know). Anything we left out? Inspired by a lot of short format content I’ve seen (and by friends who ask me questions that have answers which aren’t quite enough info for a blog post), I thought I’d see if I could do 100 videos in 100 days. I also wanted to see if they’d get more views or have different analytics than our longer format (more typical) videos. I’ll report back after the 100 days but if you want to check out the 30ish videos currently there in the meantime, subscribe to our channel! Videos were as close to a minute long as possible. They had to be close captioned. They had to be useful as stand alone resources. I’ve been a member of a BNI like organization for the last almost three years and since I give weekly 60 second presentations there, I found staying short to be relatively easy. It was hard, however, to both tell a story and a how-to in 60 seconds, so some videos were slightly more on one side in the other but ALL had an actionable item, even it was just ‘learn more about X’. Youtube and Facebook both have built in closed captioning on videos (trust me, it’s much easier to go through and fix than type the whole thing yourself) so adding closed captioning was literally an extra two minutes but I think inherently valuable. I’ve watched videos with the sound off far more often than I’ll admit so I’m sure other people do the same. You notice annoying speech tics in a whole new way when transcribing yourself. The first few videos, I found myself saying ‘you know’ a lot. This is an old habit I’ve noticed from being video taped in my college public speaking class and later student teaching but something about writing out every time you say ‘you know’ three times in a 65 second video makes you nip it in the bud. I videotaped a bunch of videos at once and scheduled them to go live in a playlist… but it looked like a bunch of ‘private’ videos to everyone else. Whoops, I thought I was so clever. Thanks Jon Hill for noticing and telling me. May we all have a friend like Jon Hill in our lives. Share your videos with that friend so they can point out weird technical stuff like that, because it’s impossible to see some things while you are logged in or otherwise ‘in it’. I felt slimy about putting it all as a blog post, as Facebook videos, as Youtube videos, etc. Even though I tell people this is possible (to make something once and use everywhere), thinking about doing this daily makes me feel slimy. Now I understand why people pay for someone else to do this for them (someone like us), rather than do it themselves. I know instinctively that there are different people/audiences on each site but it can be difficult to press that “publish” button multiple times when it’s your own project. I am glad I decided not to make them fancier. I could have added an intro/exit to each video but I thought that would be pretty annoying to people wanting to binge watch a bunch at once. It also would have added about five minutes of work to each video. In the case of the short form video, I didn’t deem fanciness (background music, screenshots, etc.) necessary. I thought I might regret this choice part way through the process but I don’t. I still have about 60 videos to make so leave a comment on this post about topics you want me to cover. I’ll report back at the end of the challenge but I hope you watch, subscribe, and share the most useful ones to you.